This summer stay in style by keeping cool and radiant. Fashion magazines like Vogue and Glamour have declared the spring-summer colors and prints to be pastel tones, checkered patterns and radiant contrast colors! Style yourself this season with baby blues, colorful checks, scarlet reds, bright yellows, and rosy pinks. CLICK + SHOP OUR JEWELRY COLLECTION! Being comfortable doesn’t have to be gray and this outfit is perfect proof! This ensemble is made up with a shoulder ruffled top, rosy pink joggers and a shimmering slip on sneaker. 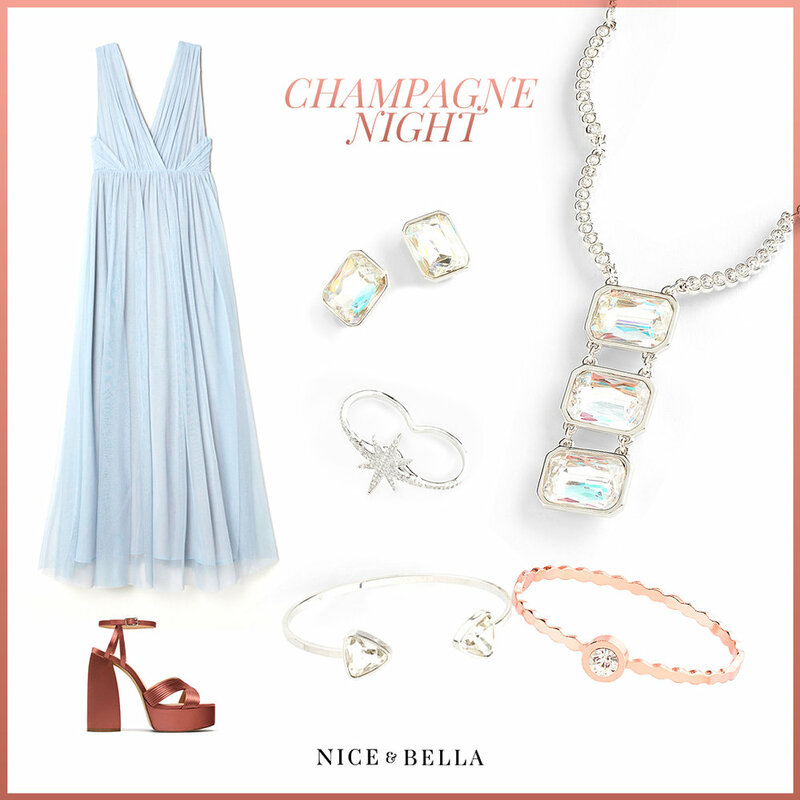 To amp up the look, it is paired with our thin, rhodium plated necklace, star stud earrings and cute, starry anklet. Comfort and style aren’t a combination people are used to. In this ensemble you will find that comfort can definitely be stylish and in season! This super comfy ensemble includes the in-colors of the season with the off-white Henley shirt, military green joggers all tied together with navy blue slip on shoes. It is perfectly accented with our dark knuckle ring men’s necklace. This everyday outfit stands out with its radiant red mini skirt and sheer white pajama shirt. It’s simmered down with a classic black sandal. This ensemble is tied together with a gold, diamond encrusted choker, bracelet, and ring to add some sparkle and flare. This everyday outfit is kept cool with a fresh, sea green mandarin collar shirt, mustard, yellow chino trousers and brown lace-up boots. The outfit is tied together with our stylish printed shades and brown leather men’s bracelet. This ensemble is all about checks with a red and white checkered romper. It’s perfectly accented with sesame yellow sandals. To add just the right amount of shine, it is accented with a gold, white flower collar necklace, earrings and a gold, white crystal anklet. If this outfit could scream, it would scream summer! 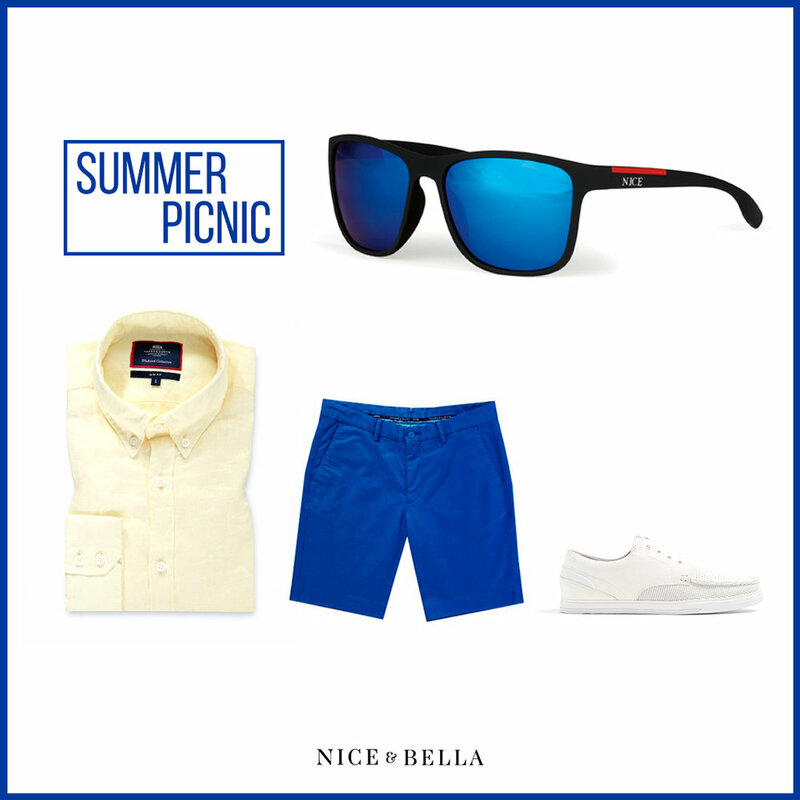 The pastel yellow shirt and cobalt blue shorts are the perfect contrast blended together with white boat shoes. This look is accessorized with our blue lens, black and red frame shades to keep your eyes protected from the sun, all the while staying in style! Bring out the bright colors with this amazing outfit! Mimic the sun with this vivid, yellow, ruffled dress and hot pink and orange strappy sandals. This outstanding outfit is tediously paired with gold, marble blue and white necklace, earrings and gold, diamond accented ring. Pastels are for men, pastels are for everyone! This outfit includes a flower patterned, multi-color button-up shirt that is simmered down with some cool lavender trousers and tan sneakers. The look is lightly accessorized with our rhodium and black watch. Pastel and shimmer galore! This long mesh baby blue dress and shimmery coral platform sandal are the perfect contrast. The superb look is accented with a rhodium shimmering crystal necklace, earrings, bracelet and ring. A dash of pink shimmer is added to the look with a simplistic rose gold bracelet. This elegant ensemble includes rose gold suit trousers, blue lounge suit, crisp white button-down shirt, and an iconic tassel-topped blue and white zig-zag loafer. Thought this outfit couldn’t get better? It is meticulously paired with rhodium, blue stone cuff-links and a rose gold, brown watch. Mind + Body / Delicious Recipes and Tips!